The Liberty Contempo Design 1-3/8 in. Large Football Knob adds a touch of style to your kitchen. The die-cast zinc body comes in a hand-applied satin nickel finish. The 1 in. fastener is sized to fit standard 3/4 in. cabinet faces and drawer fronts. The Liberty 1 in. Polished Chrome Concave Round Knob is an appealing update of traditional cabinetry hardware. High-quality die cast zinc base material finished in eye-catching chrome is an attractive finishing touch to your home decor. Mounting hardware included for easy installation. 1-3/4 Perimeter Knob, 1 per package The Perimeter 1-3/4 in. 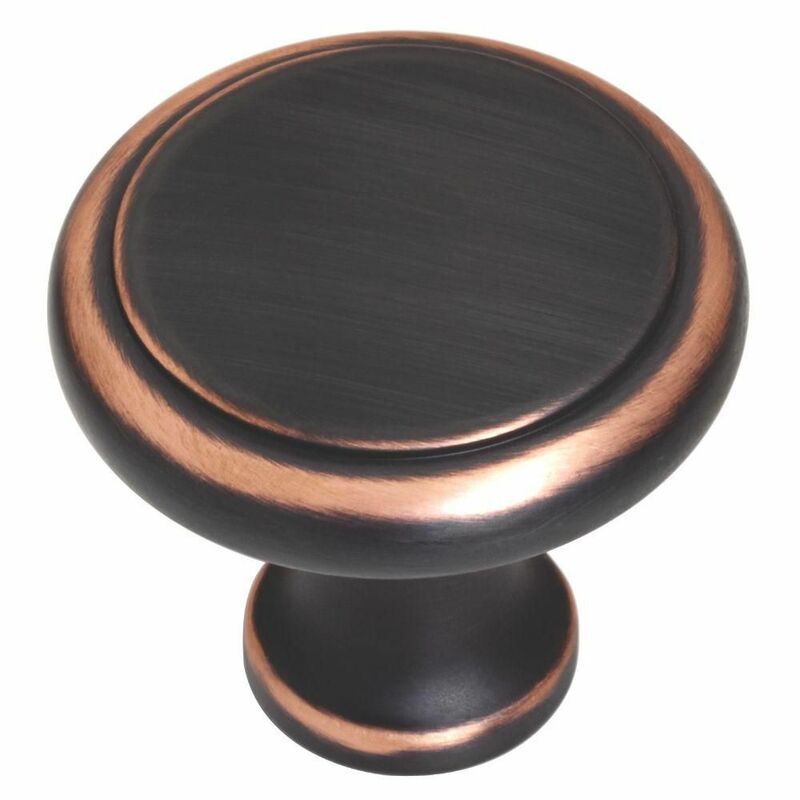 Bronze Knob has a round shape and comes with hardware for ease of installation. Premium bronze finish with copper highlights. This cabinet knob has a high-quality zinc die-cast metal base construction that allows for years of use. 1-3/4 Perimeter Knob, 1 per package is rated 4.8 out of 5 by 10. Rated 5 out of 5 by Chuck from No problems from delivery to installation, really adds a nice update to older furniture, love the... No problems from delivery to installation, really adds a nice update to older furniture, love the look! Rated 5 out of 5 by Jack from Hard to find large knob for my 100 year old mother. This one does the job, looks great at a very ... Hard to find large knob for my 100 year old mother. This one does the job, looks great at a very reasonable price. Rated 5 out of 5 by kitchentime from These cabinet knobs are just what I wanted. They are perfect for my kitchen! I love the bronze w... These cabinet knobs are just what I wanted. They are perfect for my kitchen! I love the bronze with the copper showing through. Thanks! Rated 5 out of 5 by Martha from Great! As described. Large knob! Great! As described. Large knob! Rated 4 out of 5 by Velia from Just the size I needed I ordered it online because my local store didn't have it. For some reason the delivery date was for 2 weeks out, I didn't want to wait that long so I went to the next town over and they had it in stock. I returned my order and purchased them at that store. I gave it only 4 stars because the copper highlights were very dull and I ended up buying a copper leafing pen to make them look the way I wanted. Rated 5 out of 5 by Cer from The knobs really enhanced my Kitchen Cabinet Doors.... The knobs really enhanced my Kitchen Cabinet Doors. Rated 4 out of 5 by rmib211 from Smaller knobs would be better I would have preferred smaller sized knobs but HD did not have them listed. However, these do the job well and the only complaint I have is that the accompanied screws - they are too short or too long;they need to be mid-sized.